← my video on local news + happy 1st day of spring. how i changed up cleaning + why it works really well for our family. I love having a clean house. I’m not awesome at cleaning. The older I get and the longer I’ve done this stay-at-home mom thing, the more I get into a groove and figure out the systems that work for our family and those that don’t. The same is true when it comes to cleaning products. I have learned since Tommy and I got married what products I like and what I do not. And I feel like I’ve wasted a lot of money and time trying things I thought would be awesome, and they just weren’t. So when my friend, Amber talked to me about trying Shaklee cleaning products, I was ready to take her word for it and see how it worked for our family. Amber and I went through our Dietetic Internship program together — doing almost every rotation as partners. I definitely trust her recommendations and think she is a fantastic dietitian. We started our first jobs as RDs at the same hospital, so we have worked together a lot. Amber has been a pediatric dietitian for over 3 years now and was a college athlete at Penn State, so any time I have a question about sports nutrition or pediatric nutrition Amber is my go-to RD. I had never heard of Shaklee before I met Amber, so here are some of the highlights she shared with me to teach me about the company and their products. Shaklee’s Get Clean products give a safe, powerful, green, and smart clean. They are nontoxic, have no harsh fumes, and very importantly to me are hypoallergenic! They are good for the earth, limit waste, and are an easy choice for any one. I was concerned these products would be more expensive, but because they come in a concentrated solution and you just use a little bit of them in each bottle you make, they are actually quite a bit cheaper. 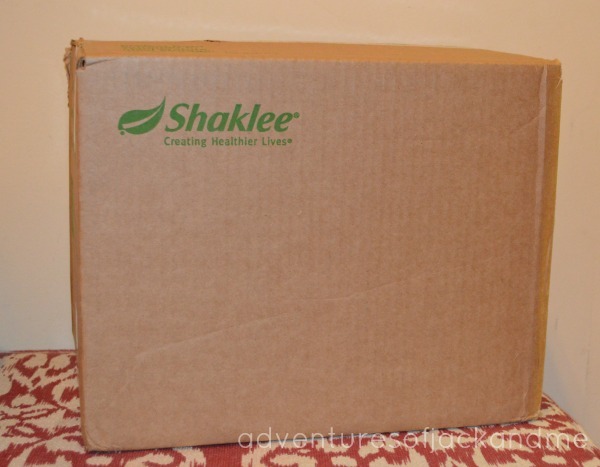 I quickly got a big, exciting box in the mail from Shaklee and have probably never been so excited to clean. I started using the all-purpose cleaner and liked it a lot. I was amazed at how little of the cleaning solution was needed to make a bottle of all-purpose cleaner. Then I used it to clean a lot of my house. My kitchen counters, cabinets, appliances. It works great on everything. I didn’t get the Basic G — which is their germicide — in my initial shipment because I just wanted to try out the all-purpose stuff, but as soon as I realized how much I liked the all-purpose cleaner, I knew I was going to want the Basic G, too. I’ve always been bothered by the smell and the fumes that come from typical cleaning products, particularly bathroom cleaners. In fact, it is an irritant for my lungs — making me wheeze at times. I had childhood asthma, which I pretty much outgrew except for a few things that are irritants — including cleaning products. Even more important than that, I realized after I had Jack that I didn’t want him to be around those strong smells. I figured if it could irritate my lungs as an adult, surely it wasn’t good for tiny baby lungs. 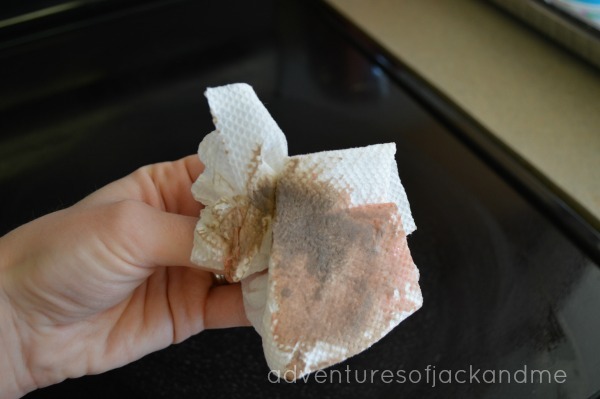 In addition to that, I could never clean while Jack was around because I worried about him being around the cleaners. Now that I have started using Shaklee cleaners, I don’t have to worry about that! 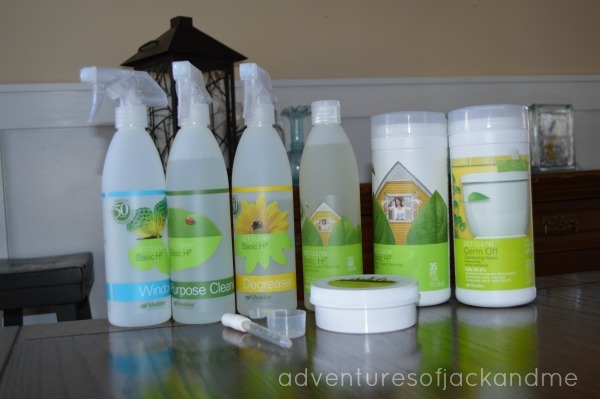 After Amber sent me the Shaklee products, the next time I needed to clean the bathrooms, I used the all-purpose cleaner and loved that I did it while Jack was at home and awake and he could come in to the bathrooms and talk to me and “help” me. It was really nice to not have to worry about him being around it. I actually placed an order with her for the Basic G because I am so impressed with the products I got and look forward to having a safe germicide to use in my home. 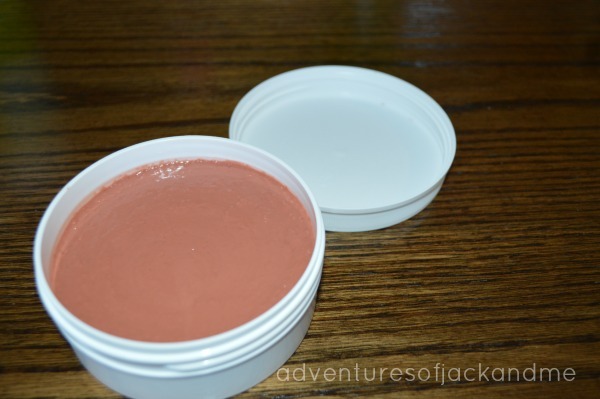 Amber told me this scour off [pictured above] was her favorite product by far before I even got the stuff. I was so surprised when I opened it to see this bright color and that it smelled so good and so natural. I texted her right away to see what was in it. She told me cherry pits! Awesome. I tried it on my stove to get that burnt on junk off, and it really did work! It was amazing how clean and shiny it left my cooktop looking. It was also really easy to clean with. I didn’t have to give my arm a massive workout scrubbing stuff off — it just came right off. This is what the paper towel looked like after just 30 seconds of using the scour off. I had even cleaned off my stovetop before using the scour off, so it was clean except for the burnt on stuff. Pretty impressive. Personally, my favorite things about these cleaning products are that I can clean with my child around without having to worry about it. I don’t need to wear gloves or open windows, and I can use them on just about any surface so I don’t have to have a separate cleaner for every thing. And for my friends who are pregnant, Amber recommends taking the Shaklee prenatal vitamin, which she personally uses. Hearing her talk about the artificial ingredients and dyes in a lot of multivitamins made me kind of cringe. I am definitely a fan of the Shaklee cleaning products and will be using them in our home from now on. I feel really good about that. Shaklee offers other categories in addition to cleaning products, but I have not tried any of them. As a dietitian I’m all about getting nutrients from food, but Amber, especially as a fellow RD, is really good about saying which things are good to supplement based on an individual’s needs and diet. Amber says that Shaklee is running a special through the end of the month. All qualifying orders placed by March 31st will receive a free membership, 15% off the order, and a free meal replacement shake [a $60 value!]. 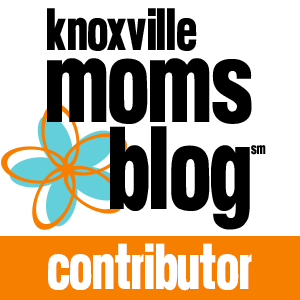 If you have questions or want to learn more about Shaklee, you can find all kinds of information on Amber’s website here. You can also reach her by email at ahs135@gmail.com. She would love to help you find cleaning products that work well for you and your family or with any other interests you may have. **These Shaklee Get Clean products were given to me but all writing and opinions are my own! that’s crazy, Betty! and how funny that you still remember that smell. That’s awesome Betty! Do you still use Shaklee products? Shaklee has been around for 50+ years now… I love hearing from others who are familiar with how great these products are!